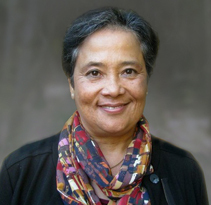 Bonnie Duran Dr.PH (mixed race Opelousas/Coushatta descendent) is a Professor in the Schools of Social Work and Public Health at the University of Washington, in Seattle and is on the leadership team at the Indigenous Wellness Research Institute (http://health.iwri.org ). She received her Dr.PH from UC Berkeley School of Public Health in 1997. Bonnie teaches graduate courses in Community Based Participatory Research (CBPR), and Mindfulness. She has worked in public health research, evaluation and education among Tribes, Native Organizations and other communities of color for over 35 years. Dr. Duran is currently the Principal Investigator of 2 NIH funded research projects in “Indian Country”. Working with the American Indian Higher Education Consortium, 22 Tribal Colleges, and UW collaborators, she is conducting 2 studies; (a) a psychiatric epidemiology prevalence and correlates study (N=3,202, and (b) a TCU-cultural adaptation of Brief Alcohol Screening and Intervention for College Students (BASICS). Dr. Duran is also Co-PI of an NIMH funded R25 HIV and Mental Health research training program, and a Co-Investigator on an NINR CBPR methods and measures study: Engage for Equity. Bonnie’s past work includes partnering with the Navajo Nation, Indian Health Service, the National Congress of American Indians Policy Research Center, and other Tribes and Indigenous Community Based Organizations on projects aimed at health equity, improving health services, and developing culture-centered health promotion. The overall aims of Dr. Duran’s research are to work in partnership with communities to design health access and prevention efforts that are empowering, culture-centered, accessible, sustainable and that have maximum public health impact. She has many publications including articles in peer-reviewed journals, book chapters and books. Dr. Duran is an Editor of the 2018 Community-Based Participatory Research for Health: Advancing Social and Health Equity, 3rd Edition. Wiley. Bonnie Duran is also a Buddhist mindfulness practitioner and teacher. She teaches long and short mindfulness retreats and advanced programs at the Insight Meditation Society (IMS dharma.org) in Massachusetts and at Spirit Rock Meditation Center (SRMC Spiritrock.org) in California, and is on the Spirit Rock Teachers Council.